Miner fees are a fee that spenders may include in any Bitcoin on-chain transaction. The fee may be collected by the miner who includes the transaction in a block. Every Bitcoin transaction spends zero or more bitcoins to zero or more recipients. The difference between the amount being spent and the amount being received is the transaction fee (which must be zero or more). Bitcoin's design makes it easy and efficient for the spender to specify how much fee to pay, whereas it would be harder and less efficient for the recipient to specify the fee, so by custom the spender is almost always solely responsible for paying all necessary Bitcoin transaction fees. When a miner creates a block proposal, the miner is entitled to specify where all the fees paid by the transactions in that block proposal should be sent. If the proposal results in a valid block that becomes a part of the best block chain, the fee income will be sent to the specified recipient. If a valid block does not collect all available fees, the amount not collected are permanently destroyed; this has happened on more than 1,000 occasions from 2011 to 2017, with decreasing frequency over time. The minimum fee necessary for a transaction to confirm varies over time and arises from the intersection of supply and demand in Bitcoin's free market for block space. 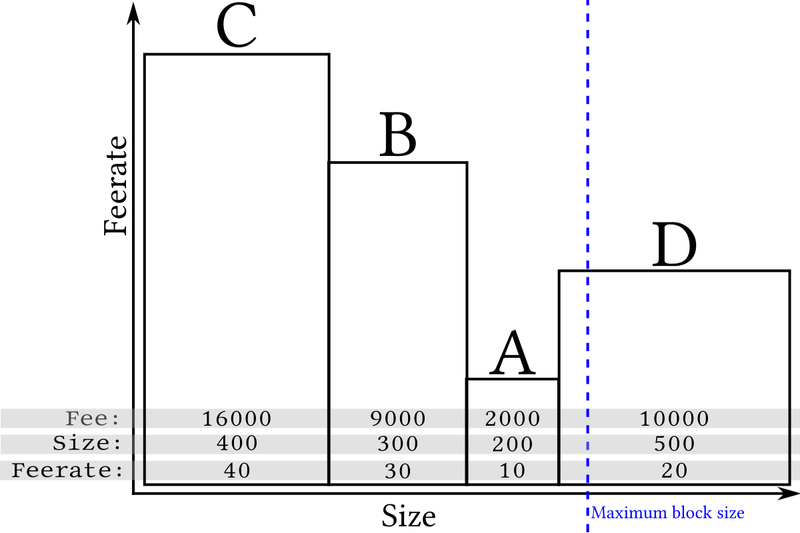 On the supply size, Bitcoin has a maximum block size (currently one million vbytes) that limits the maximum amount of transaction data that can be added to a block. During periods of higher effective maximum block sizes, this natural and unpredictable variability means that transactions with lower fees have a higher than normal chance of getting confirmed—and during periods of lower effective maximum block sizes, low-fee transactions have a lower than normal chance of getting confirmed. These variations in supply and demand create a market for block space that allows users to make a trade-off between confirmation time and cost. Users with high time requirements may pay a higher than average transaction fee to be confirmed quickly, while users under less time pressure can save money by being prepared to wait longer for either a natural (but unpredictable) increase in supply or a (somewhat predictable) decrease in demand. It is envisioned that over time the cumulative effect of collecting transaction fees will allow those creating new blocks to "earn" more bitcoins than will be mined from new bitcoins created by the new block itself. This is also an incentive to keep trying to create new blocks as the creation of new bitcoins from the mining activity goes towards zero in the future. Perhaps the most important factor affecting how fast a transaction gets confirmed is its fee rate (often spelled feerate). This section describes why feerates are important and how to calculate a transaction's feerate. Since Bitcoin only allows whole transactions to be added to a particular block, at least one of the transactions in the example above can't be added to the next block. So how does a miner select which transactions to include? There's no required selection method (called policy) and no known way to make any particular policy required, but one strategy popular among miners is for each individual miner to attempt to maximize the amount of fee income they can collect from the transactions they include in their blocks. Excluding some rare and rarely-significant edge cases, the feerate sorting described above maximizes miner revenue for any given block size as long as none of the transactions depend on any of the other transactions being included in the same block (see the next section, feerates for dependent transactions, for more information about that). To calculate the feerate for your transaction, take the fee the transaction pays and divide that by the size of the transaction (currently based on weight units or vbytes but no longer based on bytes). For example, if a transaction pays a fee of 2,250 nanobitcoins and is 225 vbytes in size, its feerate is 2,250 divided by 225, which is 10 nanobitcoins per vbyte (this happens to be the minimum fee Bitcoin Core Wallet will pay by default). When comparing to the feerate between several transactions, ensure that the units used for all of the measurements are the same. For example, some tools calculate size in weight units and others use vbytes; some tools also display fees in a variety of denominations. Bitcoin transactions can depend on the inclusion of other transactions in the same block, which complicates the feerate-based transaction selection described above. This section describes the rules of that dependency system, how miners can maximize revenue while managing those dependencies, and how bitcoin spenders can use the dependency system to effectively increase the feerate of unconfirmed transactions. 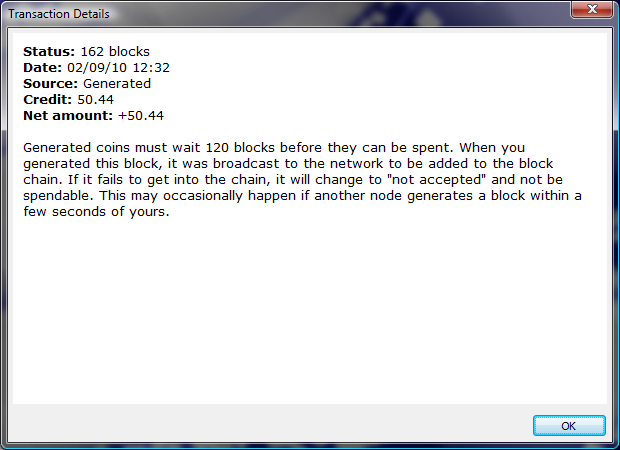 Each transaction in a block has a sequential order, one transaction after another. Each block in the block chain also has a sequential order, one block after another. This means that there's a single sequential order to every transaction in the best block chain. But if transaction A and B both appear in the same block, the rule still applies: transaction A must appear earlier in the block than transaction B. This complicates the task of maximizing fee revenue for miners. Normally, miners would prefer to simply sort transactions by feerate as described in the feerate section above. But if both transaction A and B are unconfirmed, the miner cannot include B earlier in the block than A even if B pays a higher feerate. This can make sorting by feerate alone less profitable than expected, so a more complex algorithm is needed. Happily, it's only slightly more complex. Note that this means that unconfirmed ancestor transactions will be considered twice or more, as in the case of transaction A in our example which is considered once as part of the transaction B+A group and once on its own. We'll deal with this complication in a moment. Finally, we see if we can squeeze in some smaller transactions into the end of the block to avoid wasting space as described in the previous feerate section. In this case, we can't, so no changes are made. Except for some edge cases that are rare and rarely have a significant impact on revenue, this simple and efficient transaction sorting algorithm maximizes miner feerate revenue after factoring in transaction dependencies. Note: to ensure the algorithm runs quickly, implementations such as Bitcoin Core limit the maximum number of related transactions that will be collected together for consideration as one group. As of Bitcoin Core 0.15.0 (released late 2017), this is a maximum of 25 transactions, although there have been proposals to increase this amount somewhat. For spenders, miner use of transaction grouping means that if you're waiting for an unconfirmed transaction that pays too low a feerate (e.g. transaction A), you can create a child transaction spending an output of that transaction and which pays a much higher feerate (e.g. transaction B) to encourage miners to confirm both transactions in the same block. Wallets that explicitly support this feature often call it child pays for parent (CPFP) because the child transaction B helps pay for the parent transaction A. To calculate the feerate for a transaction group, sum the fees paid by all the the group's unconfirmed transactions and divide that by the sum of the sizes for all those same transactions (in weight units or vbytes). 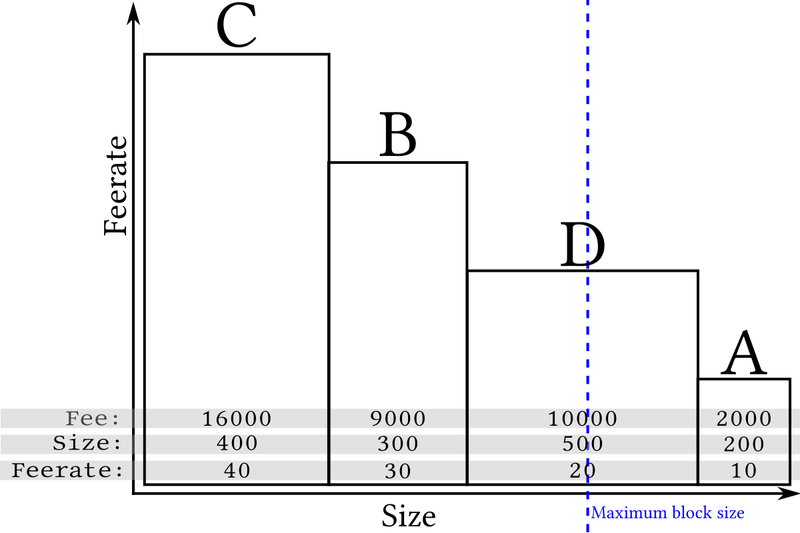 For example, if transaction A has a fee of 1,000 nanobitcoins and a size of 250 vbytes and transaction B has a fee of 3,000 nanobitcoins and a size of 150 vbytes, the combined feerate is (1,000 + 3,000)/(250 + 150), which is 10 nanobitcoins per vbyte. The idea behind ancestor feerate grouping goes back to at least 2013 and saw several different proposals to add it to Bitcoin Core, with it finally becoming available for production with the August 2016 release of Bitcoin Core 0.13.0. The following sections describe the behavior of the reference implementation as of version 0.12.0. Earlier versions treated fees differently, as do other popular implementations (including possible later versions). Users can decide to pay a predefined fee rate by setting `-paytxfee=<n>` (or `settxfee <n>` rpc during runtime). A value of `n=0` signals Bitcoin Core to use floating fees. By default, Bitcoin Core will use floating fees. Based on past transaction data, floating fees approximate the fees required to get into the `m`th block from now. This is configurable with `-txconfirmtarget=<m>` (default: `2`). Sometimes, it is not possible to give good estimates, or an estimate at all. Therefore, a fallback value can be set with `-fallbackfee=<f>` (default: `0.0002` BTC/kB). At all times, Bitcoin Core will cap fees at `-maxtxfee=<x>` (default: 0.10) BTC. Furthermore, Bitcoin Core will never create transactions smaller than the current minimum relay fee. Finally, a user can set the minimum fee rate for all transactions with `-mintxfee=<i>`, which defaults to 1000 satoshis per kB. Note that a typical transaction is 500 bytes. This section describes how the reference implementation selects which transactions to put into new blocks, with default settings. All of the settings may be changed if a miner wants to create larger or smaller blocks containing more or fewer free transactions. Then transactions that pay a fee of at least 0.00001 BTC/kb are added to the block, highest-fee-per-kilobyte transactions first, until the block is not more than 750,000 bytes big. The remaining transactions remain in the miner's "memory pool", and may be included in later blocks if their priority or fee is large enough. For Bitcoin Core 0.12.0 zero bytes in the block are set aside for the highest-priority transactions. Transactions are added highest-priority-first to this section of the block. The reference implementation's rules for relaying transactions across the peer-to-peer network are very similar to the rules for sending transactions, as a value of 0.00001 BTC is used to determine whether or not a transaction is considered "Free". 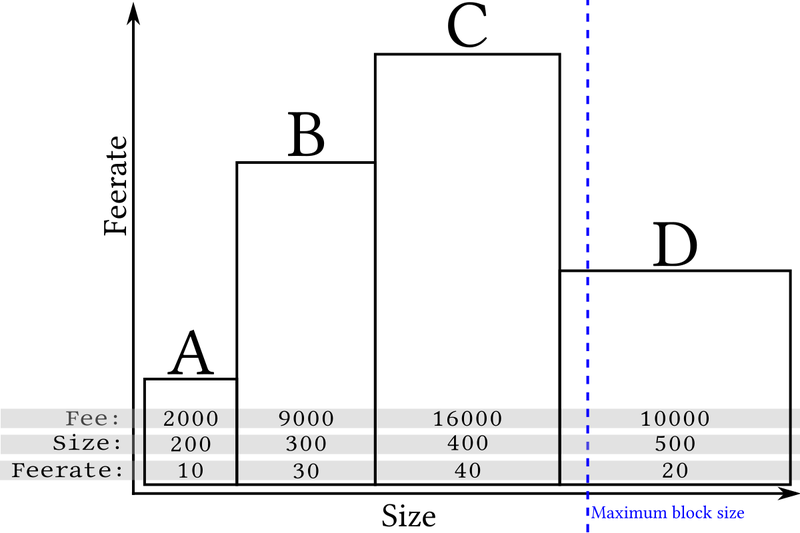 However, the rule that all outputs must be 0.01 BTC or larger does not apply. To prevent "penny-flooding" denial-of-service attacks on the network, the reference implementation caps the number of free transactions it will relay to other nodes to (by default) 15 thousand bytes per minute. As of May 2016, the following sites seem to plot the required fee, in satoshi per (kilo)byte, required to get a transaction mined in a certain number of blocks. Note that all these algorithms work in terms of probabilities. https://estimatefee.com/ - You can click any of the transactions in that graph to get more info (like its "effective fee rate" which uses recursive ancestors/descendants for CPFP) and an estimated amount of blocks it'll take to confirm. It works with any transaction in the top 100MB of the bitcoin mempool. And you can enter in any transaction txid for info when you'er wondering why it doesn't confirm. https://mempool.space/ - Shows how the next few blocks are shaping up and the range of fees per block. Helps estimate the low end fee to use to get into the next block. Historically it was not required to include a fee for every transaction. A large portion of miners would mine transactions with no fee given that they had enough "priority". Today, low priority is mostly used as an indicator for spam transactions and almost all miners expect every transaction to include a fee. Today miners choose which transactions to mine only based on fee-rate. Transactions needed to have a priority above 57,600,000 to avoid the enforced limit (as of client version 0.3.21). This threshold was written in the code as COIN * 144 / 250, suggesting that the threshold represents a one day old, 1 btc coin (144 is the expected number of blocks per day) and a transaction size of 250 bytes. It is smaller than 1,000 bytes. All outputs are 0.01 BTC or larger. This page was last edited on 10 April 2019, at 10:21.